Another homeowners association is about to be pilloried for its less-than-delicate treatment of military families. 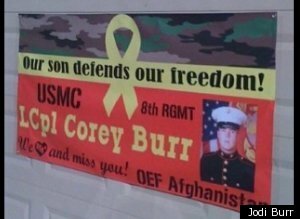 Jodi and Timothy Burr of Bossier City, La., are being sued by their HOA for refusing to remove a front yard banner supporting their son in the Marines, who is currently serving in Afghanistan, the Huffington Post reports. Despite the sensitive circumstances of the dispute, the Gardens of Southgate property owners group stuck to its guns, citing a covenant rule that prohibits all signs from public display on HOA properties, says the Huffington Post. The family, though, is arguing that the group's enforcement of the rules has been "selective" at best. This is not the first time an HOA has gotten into hot water over questionably strict enforcement of covenant rules. In the past few months, AOL Real Estate has reported on two separate incidents in which a homeowners association denied a veteran the right to fly the American flag in his yard, and another in which a disabled veteran's all-expenses-paid home was tabled by the HOA, because they claimed the plans might hurt property values. As more conflicts arise between homeowners and homeowners associations, it's important for first-time buyers to understand what joining an HOA entails. While there are certainly value-add services that the associations provide (from property upkeep, maintenance and neighborhood decorum), some buyers might find the regulations too restrictive -- or, as seen in this case and others, far too subjective. In some states, HOAs are also granted the power to sell your home if you do not stay current on your homeowners association fees -- even if you own the home clear and free. To read more about the Burr family's conflict, see the full story at The Huffington Post.